In terms of pens, the nearest I’ve come to The Grail was the discovery a few years ago of the Uni-ball Signo Bit with a .18 point which has been billed as the world’s thinnest pen capable of writing words on a grain of rice. Jetpens has a photo of this feat and it’s rather impressive. While I have yet to attempt the “writing on my food thing,” I can attest to the capabilities of this pen on paper: absolutely amazing. After putting the first experimental Signo Bit .18s though their paces -including being impressed into travel journal service while rattling around Central America under less than ideal conditions- I immediately bought several more and a box of them soon thereafter. 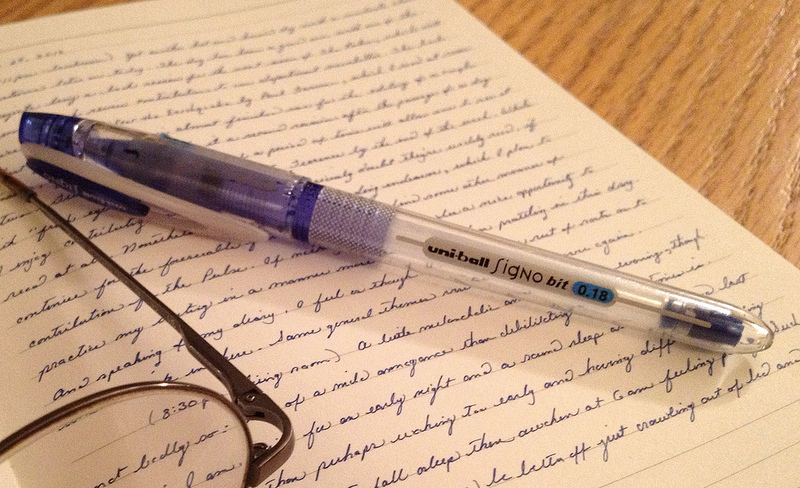 The Uni-ball Signo Bit .18 is, if anything, a specialty pen and may not be well-suited for everyone, especially those who tend towards a large or heavy-handed writing style. My penmanship has been assessed as somewhere between tiny, microscopic, and “WTF,” depending upon the charitable inclination of the particular observer, so the .18s feel very natural, especially when paired with good quality paper. While the .18s can at times feel a little scratchy, such is also the case with other micro-point gel pens, especially if one is writing fast, or too large, or perhaps using Moleskine cheap paper. 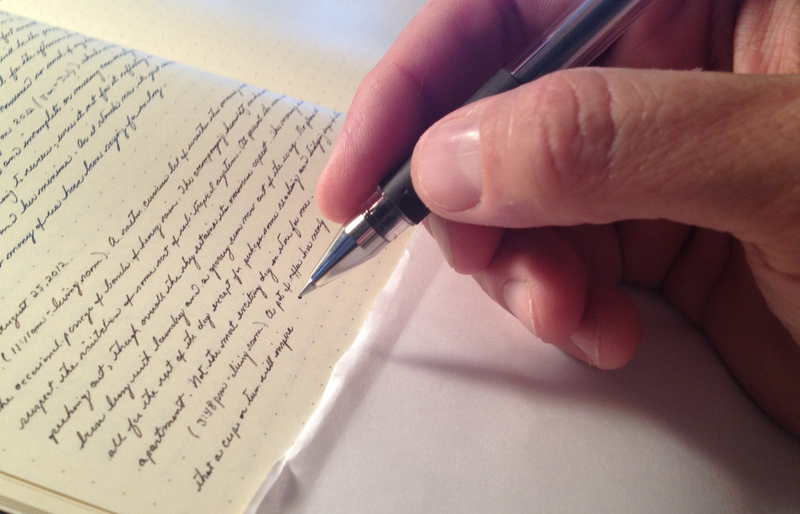 There is a certain technique, an art if you will, for achieving a novel and pleasurable writing experience from the Signo Bit .18s. Of the specifics I’ll perhaps write to exhaustion in a later post; the purpose of the moment is the pen itself and there’s much to say, both good and..well….not bad, as there’s really nothing bad about this pen. Maybe “meh” for those qualities which aren’t good, but not necessarily bad either. The Good: The Uni-ball Signo Bit .18s are well designed. They are both lightweight and well-balanced, with or without the cap. My preference is to write with the cap snapped onto the end of the pen as it seems to provide a slightly more balanced feel. As one would expect, the standout feature of the .18s is their capacity to write SMALL. In this respect it excels, outperforming all other micro- point pens I’ve tried, even the Sakura Pigma Micron 005 (.20mm), which has long been one of my favorites. The Meh: The biggest drawback to the Signo Bit is its fragility. By no means is this a deal-breaker, nor exclusive to the Signo Bit line; one simply need exercise caution to avoid dropping it. If it lands point down, either capped or uncapped, the game is over. Experience has also shown that a pen landing on its side can have a detrimental effect, with some ink delivery mechanism thingie inside going all wonky, rendering the pen useless. Ink supply can be somewhat short-lived, particularly if one does a lot of writing, but such is true with a number of gel ink pen models. And since we’re talking meh, a cautionary note: be ever so careful about lending this pen to friends, colleagues, or anyone in need, for this charitable gesture may doom your pen. While inadvertent theft is sometimes a concern as with any pen, the real danger arises from those who write as though they’re carving their name into a block of wood. The 18s are among the delicate lotus flowers of pen world and don’t hold up well to this sort of abuse. I’ve learned the hard way; more than once the final act of one of my pens has been someone else’s signature. For the well-being my .18s, I’ve since found it best to say “no” (or a polite “hell no”) when asked whether I have a pen, even if the person in need sees it clipped in my shirt pocket. Unfortunate yes, but the resulting awkward moment will pass and the .18 will live to write another day. So at any rate, the Signo Bit .18 is a wonderful pen and the nearest to perfect I’ve come across to date. While I use it daily, it’s not a general use pen, being reserved primarily for journal writing or situations where small writing may be preferred (such as jotting notes in the margin of a book); however, I can easily envision other, perhaps more creative uses, such as writing ridiculously small notes for colleagues.